Twenty years ago this week the FA Premier League opened its doors as 22 clubs competed in its debut season. As we all know Coventry City were one of those teams and began 1992/93 under the second reign of Bobby Gould. With the bulk of Terry Butcher and Don Howe’s legacy at his disposal, Gould handed opening day debuts to two players recruited from the lower leagues. Substitute Phil Babb signed from Bradford City while £250,000 headed to Swansea City as the services of speed merchant John Williams were secured. During his three seasons at Highfield Road Williams appeared 86 times and scored on 11 occasions. He was the Sky Blues' first ever goal scorer in the Premier League and his goal on home debut against Middlesbrough was the second quickest in Premier League history. Three days later he followed this with both goals at Tottenham as City won 2-0. They secured three straight wins with a 2-1 triumph at Wimbledon to become the first outright leaders of the new division. His celebration with Mick Quinn at Highbury in the 3-0 opening day success is well remembered as is the pace and strength he used to his advantage against unsuspecting defences. 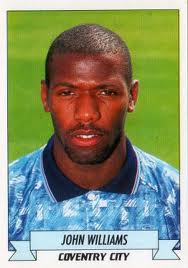 Williams departed for Wycombe in the summer of 1995 having etched his name into Coventry City’s Premier League history. Four months on from THAT day at the Ricoh Arena against Doncaster Rovers, my first sighting of Andy Thorn’s men since that woeful afternoon took me to Bristol Rovers last Saturday. Clearly apparent was the freshness on show, new personnel on the pitch but also a shake-up in the dugout. A back four of Clarke, Hussey, Wood and Reece Brown had the odd hiccup but on the whole looked solid and this augurs well. New recruit Adam Barton looks a more than decent acquisition while Carl Baker will shine at this level. Gary McSheffrey should mirror the form he showed on loan to Luton many years ago and create havoc while Kevin Kilbane’s experience will calm the nerves. Conor Thomas has removed Gary Deegan from his Christmas card list after his recent crocking, hopefully by the time he returns to fitness we'll be lodged in the upper reaches of the division. David Bell's hip injury I must have missed on Sky Sports breaking news, I can see another bit part season for him, he has the technique but seems physically unable to play 46 games. The pairing of Cody McDonald and Callum Ball looks good, Cody the 20-goal marksman we've craved since Dion while Ball could well be the ace in our pack with his left foot and strength. Stephen Elliott appears on the attacking periphery at present while John Fleck’s goals from midfield will support the aforementioned trio and catapult at least one City player into the PFA Team of the Year for a pleasant change. So, all in all, a cause for sky blue optimism? Definitely. Footnote: Kevin Kilbane's experience came to the fore in the 90th minute at Dagenham and Redbridge last night - let's hope for more of the same at Yeovil.